The UN tribunal investigating the assassination of the former Lebanese PM Rafik Hariri in 2005 has said it will try the four accused in absentia. 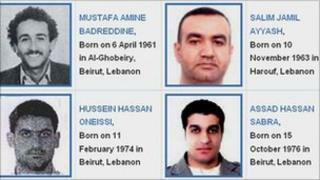 Shia Islamist group Hezbollah members were named as suspects and warrants for their arrest issued last summer. But its leaders have refused to hand them over and the Lebanese authorities have not been able to arrest them. Hezbollah denies any role in the killing of Hariri and 21 others in Beirut in February 2005. The Special Tribunal for Lebanon (STL) issued a statement detailing the steps taken by the Lebanese authorities to apprehend the accused. These included multiple attempts by the Lebanese authorities to find the accused at their last known residences, places of employment, family homes and other locations, it said. "The trial chamber concluded that all reasonable steps have been taken to secure the appearance of the accused and to notify them of the charges against them," the Hague-based court said in a statement. It did not say when the trial would start. His assassination plunged Lebanon into a series of political crises, killings and bombings that led to sectarian clashes in 2008. The STL's 47-page indictment issued in August last year alleges that Mustafa Badreddine, a high-ranking figure in Hezbollah, was the overall director of the operation. Salim Ayyash, another senior Hezbollah official, is alleged to have co-ordinated the attack on the ground. The other two suspects, Assad Sabra and Hassan Oneissi, are accused of complicity and of trying to sow a false trail by producing a video tape with a fake claim of responsibility. The STL was created by a 2007 UN Security Council resolution at Lebanon's request.